First published July 3, 2018. Updated January 7, 2019. There is a lot of interest and research being done in the area of Development Origins of Health and Disease, also known as DOHaD. The Developmental Origins of Health and Disease (DOHaD) is a field of study that has emerged after researchers noticed associations between some health conditions and people’s exposure very early in life to different lifestyles. These observations were made in very large cohort of humans who had been followed for a long period of time, and for which researchers had data related to their birth. They were then able to draw links between what had happened at birth (for example, how much each person weighed at birth) or after birth (for example, was each person breastfed or formula fed) and their health condition 40, 50 or even 60 years later (for example, do these people have heart disease as adults?). It is pretty impressive to think about this: what your mom did while she was pregnant can set you up on a trajectory of health (or disease). These 9 short months can have a profound impact on your health, for the rest of your life! And if you have children yourself, what you have done while you were pregnant was just as impactful! It is not to put the blame on you (no guilt, we all do our best! ), but just to appreciate the marvel of life and the power parents have on shaping the life of their children (literally!). You might have come across that idea, but presented as the importance of the first 1000 days of a baby, from conception to 2 years of age. It is a crucial period of time. Researchers from around the globe are studying mothers’ lifestyle during pregnancy and how that affect the health of their offsprings as they grow up. One nutrient keeps coming up: choline. It is definitely a hot topic in the area of maternal and infant health. It seems like we might have underestimated the importance of choline on baby’s development in early life, or perhaps we just realize how much we don’t know about it (like with most things in nutrition, it is a fairly young science after all!). You might have heard of the importance of folic acid in the periconceptual period for the prevention of neural tube defects. Choline however was not under the radar until 1998 when it was recognized as an essential nutrient. It then officially made it to the Health Canada Dietary Reference Intakes, with a daily recommended amount to consumed. Even during the establishment of the Dietary reference intake for choline, very limited data was published (meaning not a lot of research had been done on the subject). As a consequence, a required daily dose was determined, but with the suggestion that more research is needed to refine our recommendations at different life stages. Little is known about the importance of choline in the perinatal period, but a lot of research is happening at the moment! Choline is a key nutrient to create more complex molecules like phosphatidylcholine and sphingomyelin (these are a family of molecules called phospholipids) and acetylcholine (in the family of molecules called neurotransmitters). Choline is the methyl donor for the formation of these more complex molecules. These complex molecules are very important in many metabolic steps that keep our bodies alive. Phosphatidylcholine and sphingomyelin are in all the little cells of our bodies keeping them in shape, while acetylcholine plays a role in our brain for stuff like memory, mood control, and cognition. Quite important! Choline is the building block of more complex molecules that are important in many steps on our bodies: brain function, mood control, muscle function, etc. Can your body produce choline? Yes, and that might explain why for the longest time, choline was not considered an essential nutrient. A nutrient is labelled as essential if we absolutely need to consume it via food to get enough for our needs, and basically survive! Choline is a bit different as it can be produce by our bodies in our livers, but not in quantity large enough to meet our needs. Choline can be produce in small amount in our bodies, but we shall eat it in our diet to fully meet our needs. 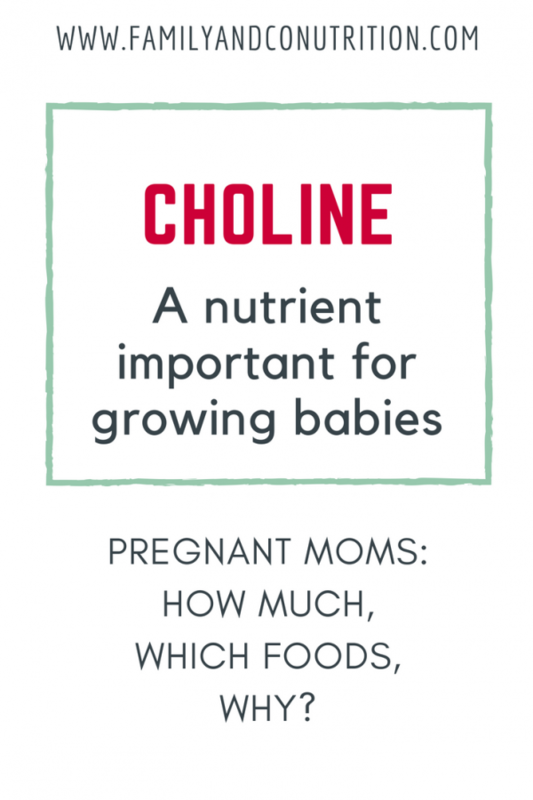 Although limited evidence exist to determine the optimal intake for each age groups, we know pregnant and lactating women have increased choline needs. Are you eating enough choline? Choline is mostly found in animal-based products like meat, poultry, fish, dairy products, and eggs. It is also contained in some vegetables, beans, nuts and seeds, and whole grain products. On top of these natural food sources, the form phosphatidylcholine is present in lecithin, a very common food ingredient of processed foods. Lecithin serve as an emulsifying agent, meaning it keeps water and oil mixed together in food like salad dressing, margarine and other sauces. Despite this, epidemiological studies have highlighted that the majority of the population is not consuming enough choline. Choline is present in a lot of food, most of it from animal-based products, but majority of the population doesn’t consume enough of it. 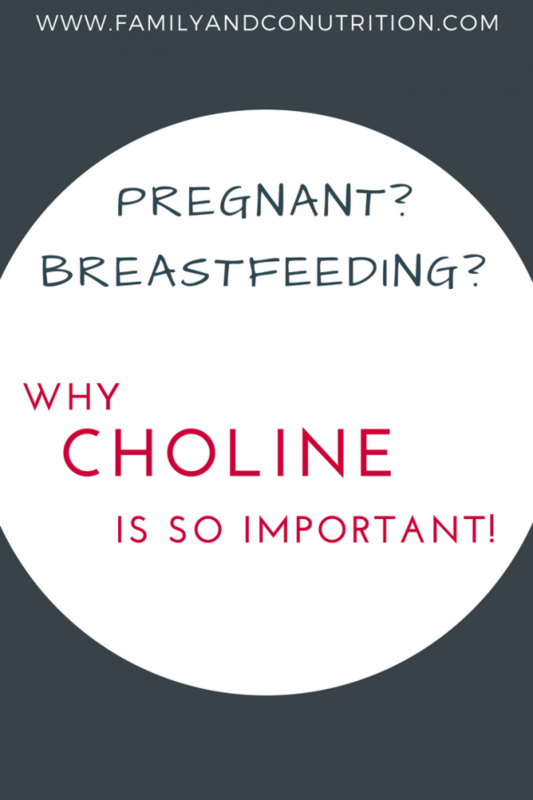 What’s the research saying about choline in the perinatal period? Folic acid is the nutrient known (and contained in prenatal) to prevent neural tube defects, but choline could be just as important. Some research points in that direction, and it makes sense as choline and folic acid are involved in the same metabolic steps. Choline could be important for the development of the memory, which happens in the hippocampus, a region of the brain. The hippocampus develops in the late stage of pregnancy and requires choline to grow adequately. Various studies have been done where pregnant mothers were supplemented with choline, and their offspring were assessed throughout childhood. Mixed results were observed where in some cases, higher maternal choline intake were linked to better cognitive functions in their offsprings. As we often hear in the world of science, more research is needed to understand if and how much of choline is necessary to improve cognition. More is to be discovered on how choline can play a positive role in the development of babies. 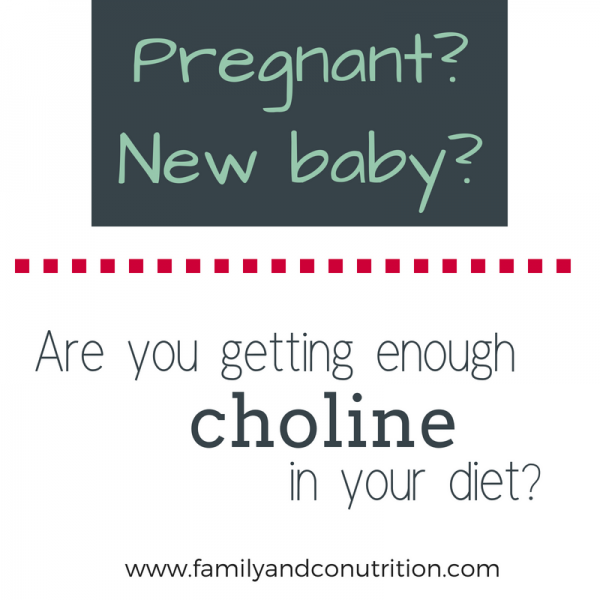 So how do you get enough choline for you and baby? As always, the best way to ensure adequate intake of all nutrients is to adopt a varied and balanced diet. One easy way is to build your meals and snacks following the healthy plate. Food sources of choline are predominantly animal-based: eggs, meat and fish. The winner is liver, followed by egg yolk. If you avoid these food items, it might be important to meet with your registered dietitian to ensure your current diet allows you to meet your needs (for choline and other important nutrients). A choline supplement might be recommended in some cases, but we always favour food over supplement when possible! If you are pregnant and taking a prenatal multivitamin, look at the label to see if it contains choline in it. 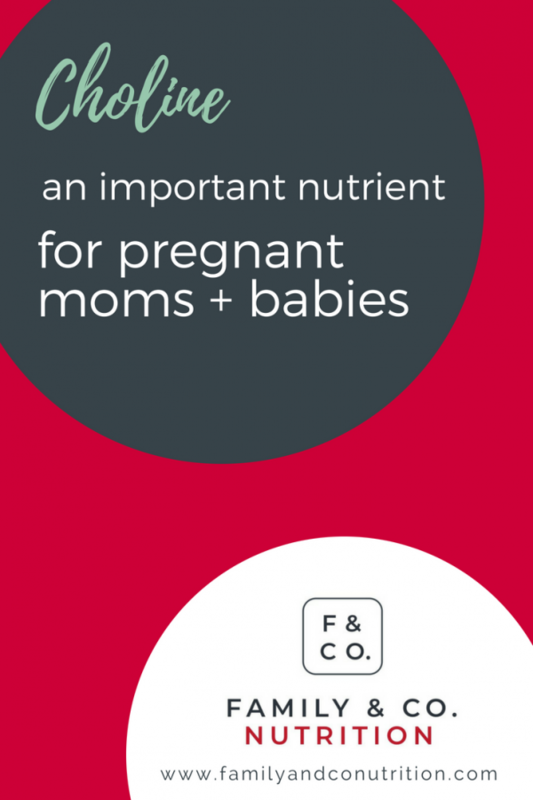 Not sure if your prenatal is adequate, here are our suggestions to choose the right prenatal multivitamin. The most popular prenatal multivitamins on the market don’t contain choline at all, due to the nature of this nutrient. 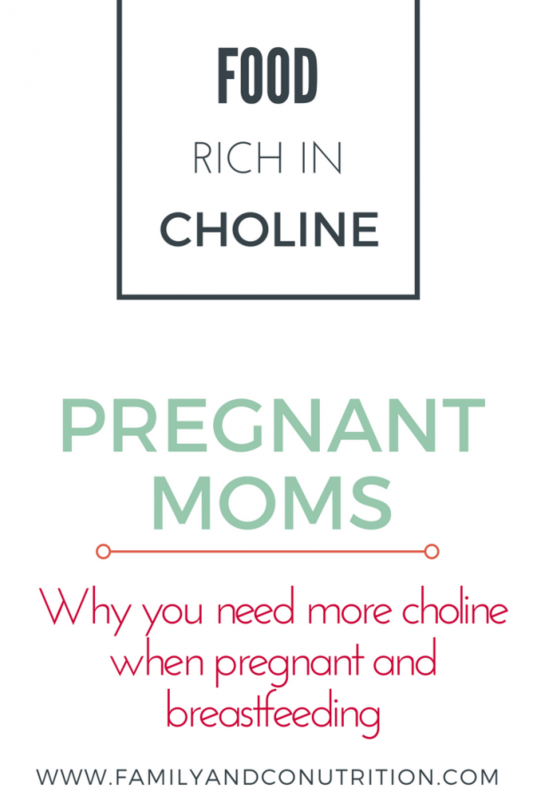 In fact, adding choline into your prenatal pill would likely make it bigger and then more difficult to swallow. If you worry that you are not eating enough choline, meet with your registered dietitian who can assess your diet, your prenatal multivitamin, and help you decide if any changes should be made. The same advice apply for the lactation period: adopt the healthy plate, and focus on eating various foods that you enjoy! Continue taking your prenatal, and check with your registered dietitian if you have questions. It is possible for new moms get enough choline from food, and adopting a healthy diet is your best bet! 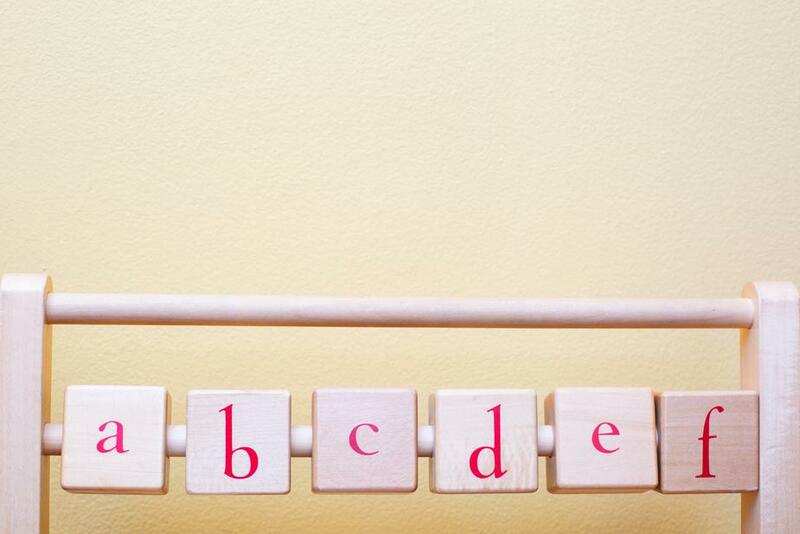 Is your baby getting enough choline? 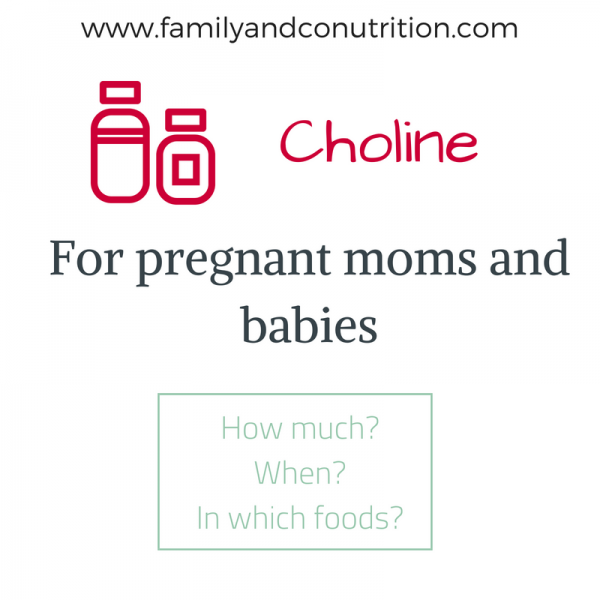 If your baby is formula fed, s/he will receive the appropriate amount of choline as formula does contain choline. 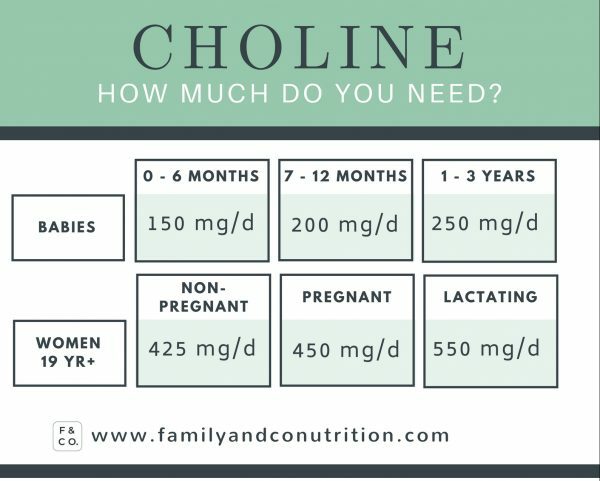 If you are breastfeeding, your milk will also contain choline, but in an amount that will depends on your choline intake. 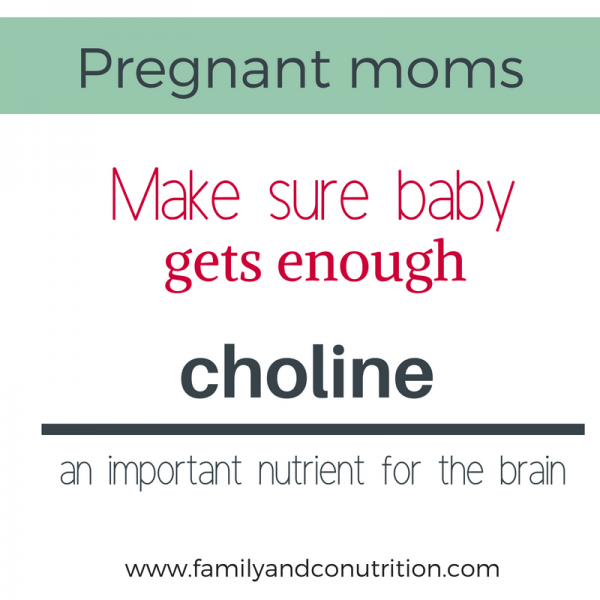 In both cases, your baby doesn’t need a supplement of choline, but mom should definitely adopt a healthy diet! That will provide you with the choline you and baby need (if breastfed) but also with the energy required to take care of a baby! Both breastmilk and formula contain choline to meet baby’s needs. Gluckman PD, Buklijas T, Hanson MA. The developmental origins of health and disease (DOHaD) concept: Past, present, and future. InThe Epigenome and Developmental Origins of Health and Disease 2016 (pp. 1-15). Leermakers ET, Moreira EM, Kiefte-de Jong JC, Darweesh SK, Visser T, Voortman T, Bautista PK, Chowdhury R, Gorman D, Bramer WM, Felix JF. Effects of choline on health across the life course: a systematic review. Nutrition reviews. 2015 Jun 24;73(8):500-22. Wadhwa PD, Buss C, Entringer S, Swanson JM. Developmental origins of health and disease: brief history of the approach and current focus on epigenetic mechanisms. InSeminars in reproductive medicine 2009 Sep (Vol. 27, No. 5, p. 358). NIH Public Access. Wallace TC. A comprehensive review of eggs, choline, and lutein on cognition across the life-span. Journal of the American College of Nutrition. 2018 May 19;37(4):269-85. Zeisel SH, Da Costa KA. Choline: an essential nutrient for public health. Nutrition reviews. 2009 Nov 1;67(11):615-23. 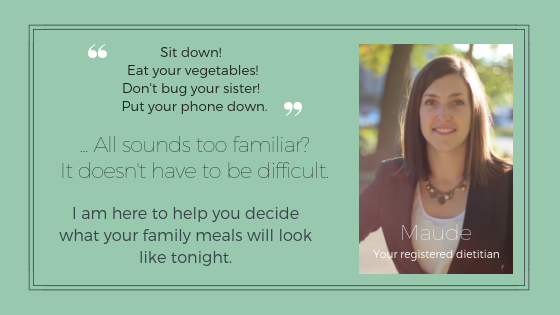 Sharing responsibilities at the dinner table: Parents decide of the What, When, How and Where, while kids decide If, and How much. A prenatal multivitamin is important before, during and after pregnancy, for you and baby. We are so glad you find the posts helpful! Thank you Cecila! Thank you for sharing the amazing blog. Glad you like to read our blog, Rahul!